And sometimes the universe will send us warning signs when we’re wandering off course. This happened to me recently but for the first time in my life I realised what was happening and I managed to turn it around. I kept the faith. Following the most incredible 21 day run of pure positivity, energy, and results, I decided to ‘celebrate’ by taking life a little bit easier. Well deserved I thought. Except in the few days of taking time out from ‘commitment’, I noticed certain signs which triggered negative thoughts and energies, and sure enough, felt a couple of bricks upside the head!! They were silly little things initially… feeling exhausted (hardly surprising given the gruelling work schedule I’d assigned myself in the previous 21-days), stubbing my toe (not like me as I’m usually pretty steady on my 6 inch heels), spilling my tea over my gorgeous pink handbag (completely out of character), receiving an unexpected bill, a few awkward and dissatisfying conversations, a general sense of feeling uneasy, and then my car broke down on the most important day of my business career to date… at which point I had tears in my eyes. This sequence of signs happened over a period of three days which was enough to kick me into action and begin by analysing what had changed to cause me to go off course. I’d gone from a strict no-carb diet to overloading my stomach with pizza, pasta and far too much chocolate! My gym routine had disappeared completely. I’d re-introduced alcohol after a mostly dry January and reduced my water intake (although not consciously). I also hadn’t updated my journal once in the previous 4 days, thereby not touching base with my unconscious mind and subsequently lost focus, nor had a read a single page of my most recent book. And, what’s more, I’d missed my Friday blogging deadline! I’d regressed basically. And whilst I certainly deserved a break following the success of my 21-day kickstart/detox, indulgence wasn’t the answer. Success should be rewarded, absolutely, but I hadn’t rewarded myself with positive actions, I’d done a complete 360, and I felt like the universe was launching bricks at me… seriously… I just didn’t get it. Not for the first three days anyway. Then on Saturday morning, faced with the biggest day of my business career, the Open Day for The Academy Building (those close to me will know exactly what this entailed), I had two choices… allow the tears to flow and cave to the latest brick upside the head (car breaking down), OR, force myself back into the realm of furious self-belief and positivity, and let me tell you it’s a hard hill to climb, especially when you are completely responsible for having slipped all the way down it! The morning was a disappointing start but as the day progressed and I tuned into my true self, I found myself guiding people, offering advice, providing opportunities, cultivating a friendly and supportive environment and creating pure joy for myself and those around me. It was heaven. It was me. And as the day drew to a close, the one thing I really wanted to happen (and feared I might have cocked up completely because of my slippery slope) materialised… in a glorious little bubble of musicality and ambition. The ideal client. And one I can’t wait to get working with!! We need these bricks. These are good bricks. (Statement drenched in sarcasm but I refuse to use emojis on a blog. This is a piece of literature for pities sake. And one which is supposed to serve as a guide for enlightenment). (More sarcasm, sorry can’t help myself!). Seriously though, we need warning signs so we know when we’re wandering off course. I’d completely messed up, and I don’t mind admitting it. Treating myself was fine. Taking a break after a gruelling schedule and huge success was also fine. What I failed to do was to do these things whilst staying true to myself and staying in tune with my long term goals and vision. It wasn’t the right time to over indulge. I became complacent. The universe was trying to wake me up. She did. January has smashed goals I didn’t even think of setting because I thought they were too big!! Why the hell would I hit the pause button?! Momentum is what was required. Instead I hit the brakes at 10,000mph and I caused myself to spin… right off the highway and into the verge. Well done H. Muppet. So what now? What happens when the universe throws a brick at you? What do you do? Build with it baby!! Take that brick and add it to the foundation of your LIFE! I learned an awesome lesson. For that I’m truly grateful. I’m also completely hyped that the universe even sent me those bricks to wake me the hell up! Yes please and thank you! That’s faith. Faith in the universe. 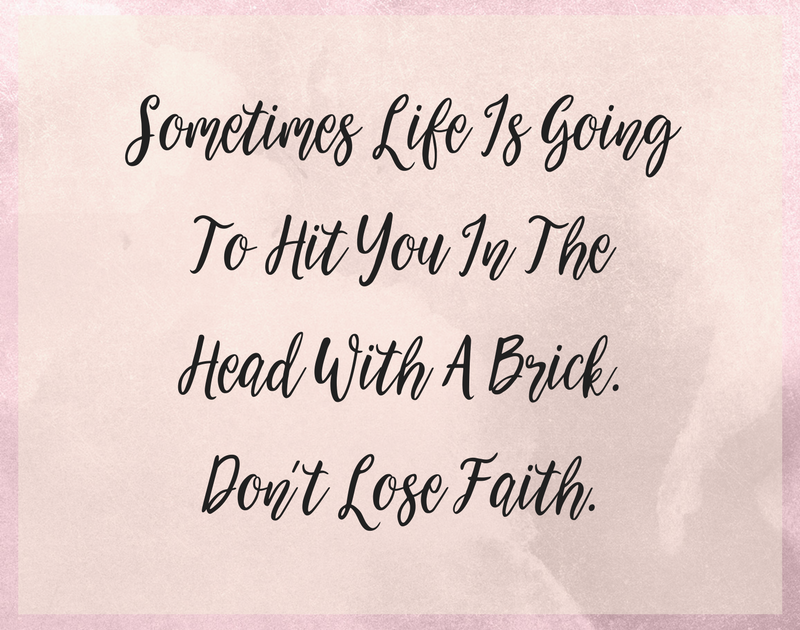 And faith in yourself… to take those bricks and see them as positive building blocks for better things. So guess what?! Tomorrow I’m starting another 21-day detox/kickstart… and on day 22… I’m not going to make the same mistakes! And doing all of this whilst remembering my 2016 resolution to always be kind and mindful, AND my 2015 resolution to always be positive!! It sounds tough when it’s all listed out like that but I can’t tell you how FANTASTIC I felt doing it, and completing it. The subsequent success of my various businesses in that time frame also surpassed anything I’ve ever achieved before, more than 8 times over (measuring in monetary terms). Everyone’s definition of success is completely different. Mine for January happened to be financial. It’s going to be the same for February but you can measure your success in any way you wish, be that health and fitness, success at work, in relationships, or by the health of your mind and spirit. Set yourself a goal that is achievable in 21 days and measure out the steps you need to take in order to get to where you need to be. It might take some drastic lifestyle changes like the ones I’ve listed above but if you want results that you’ve never had before, you’ll have to do something you’ve never done before!! Just remember… when you get to day 22, don’t make the same mistakes I did. And if you experience a brick… don’t lose faith.